What does it look like for a college or university to wholly adopt principles of reconciliation? In an effort to try to find out, Yukon College is using its upcoming transition from a College to a University to develop a new governance model that holds indigenization as a fundamental tenet. Part of their challenge is that information about indigenization in the post-secondary sector existed, but only in relation to specific areas (programs, curriculum, space, policy, etc.). Information about indigenization at an institutional level, or about shared governance, meanwhile, was critically lacking. 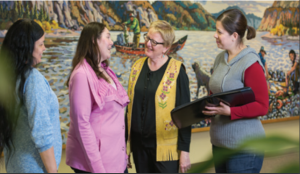 Sensing a gap and an opportunity, Yukon College decided to lead a conversation. In March 2018, they brought together a group of 30 people, including representatives from fifteen post-secondary institutions and multiple Yukon First Nations. During their gathering in Whitehorse, this group shared perspectives, experiences and ideas on bridging university governance and indigenization. This report captures valuable, tangible lessons for moving reconciliation forward in the post-secondary sector, and actions for stepping up to address the calls to action by the Truth and Reconciliation Commission. Read the Indigenizing University Governance Report here.